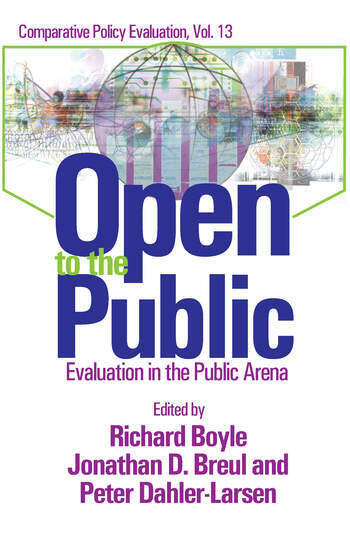 Open to the Public grows out of concern with evaluation in the public arena and the struggle to understand how best to use the information it generates. Many concepts and models of evaluation, how to undertake it, and how to make it more useful, were developed before government performance became of so much interest to the public. In fact, it is arguable that recent changes in the forms, shapes, structures, and media through which the information developed in the process of evaluation becomes public, require new ways of thinking about its role in society.What is the role of evaluative information in the public arena today? How, when, and under what circumstances does the actual use of evaluative information take place, and what are the forces at play? By compiling and comparing international case studies, this book considers forces that make the information produced in evaluations increasing "open to the public." They provide insights into the many factors that influence evaluation and its use in the public arena. Their case studies include such current topics as: "spin doctoring" of information by the media and this practice's relationship to evaluation studies, the hotly debated issue of school performance, and information about it aired in the public arena, and the controversial link between budget processing and government performance.This book will be invaluable to those conducting evaluations, public employees and commissioners, and those studying public administration.